Waterbury Clock Co. gallery clock, "Corrider" ca 1915. 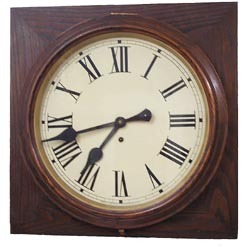 8 day timepiece, 18 inch metal dial in excellent original condition. Dark oak case has the original finish and is all original except for the replaced trap door on thebottom. Large wood bezel is hinged on top. It is running just fine but ifyou plan extended use I would recommend a cleaning. Overall dimensions ofthe case are 23 inches square. Pendulum bob is a replacement. Nice Waterbury label on the back spells the clock "Corrider" with a factory stamp of 1915. Ly-Waterbury No. 637 spells the clock, "Corridor".